Filling in for Steph as she recovers from self-induced smartphone elbow and probably carpal tunnel syndrome. I love palmiers. As someone who doesn’t really go in for most things in a bakery, a good palmier is a lifesaver for me when I get roped into a “cute cafe” date (click that link, it’s from 7!! years ago). Steph really loves whiling away lazy afternoons in cute trendy cafes, but for me, they hold almost zero appeal: no beer, no fries, no chicken wings, and hard-to-find seating, usually. Give me a brewpub any day. Once in a while a new trendy bakery/cafe opens up and I’ll take Steph, and inevitably nothing on the menu appeals, but if they make croissants in house, they almost always have palmiers as well. 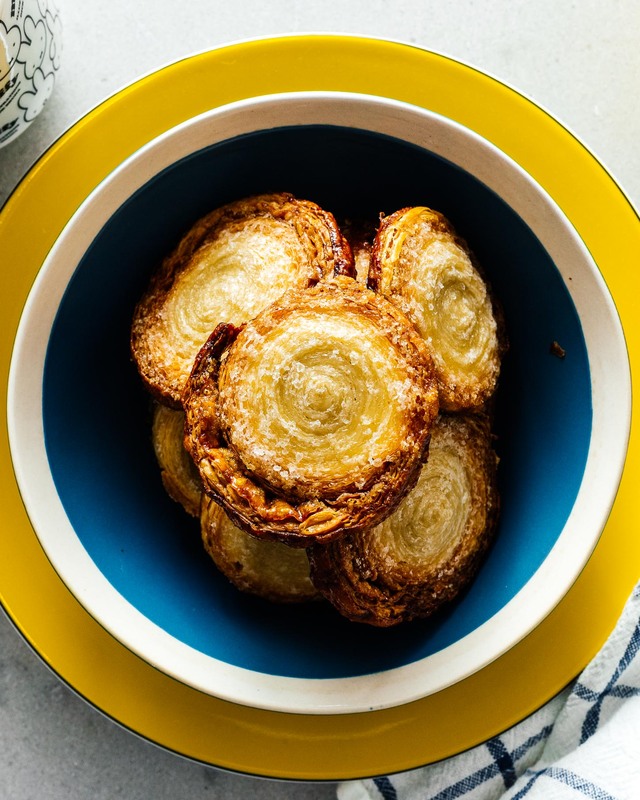 For me, nothing is a better sign of a good bakery than their palmiers: sweet, crispy, flaky, and much much cheaper than a $4 croissant or a $5 pain au chocolat, but still an addictive excuse to consume a stick of butter. I’m not even picky about them. A entire box of supermarket palmiers and a glass of whisky as dinner and I’m in heaven. 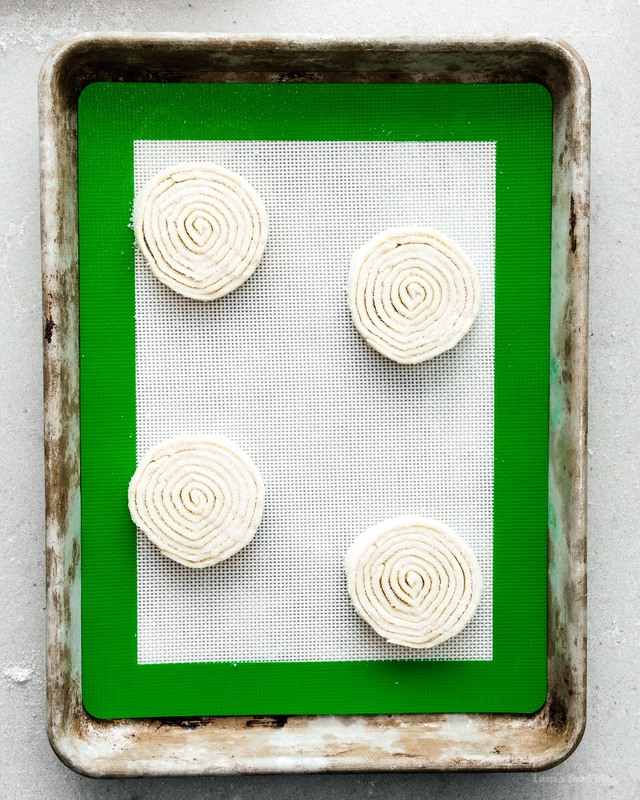 This recipe is for those late-at-night times when you can’t be bothered to go to the grocery store (or it’s closed), but, if you’re like us, you have a roll or two of puff pastry in the freezer. I could lie and say I made these for Steph but in reality, she demanded that she was still useful and insisted on making these for me tonight, so this is her recipe. 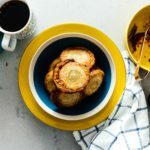 My only contribution is writing this post plus a pro tip: buy the all-butter puff pastry, it makes a huge difference. Making these made her arm worse, she should have continued resting it. Send Steph good thoughts! 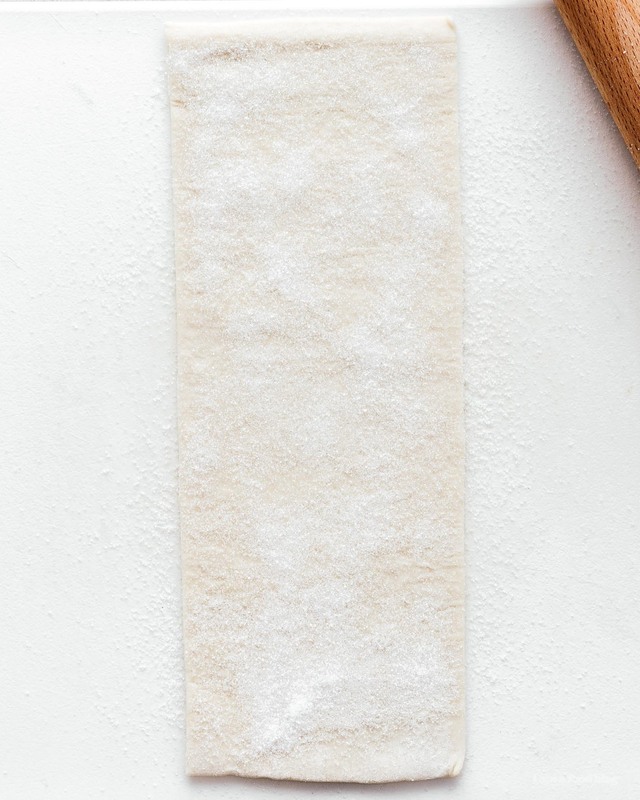 Heat the oven to 350°F and line a baking sheet with parchment paper. Cut the puff pastry into 3 equal pieces. Dust your work area with an even layer of sugar. Lay out 1 piece puff pastry and sprinkle on more sugar. Use a rolling pin to gently roll the sugar into the pastry. Repeat with remaining sheets of puff pastry. Roll up like you’d roll a carpet when you’re moving. When you run out of pastry, squish another on one on just like rolling up an extra rug. Wrap tightly in saran wrap and freeze until firm about 10 minutes. Sliced the roll into 10 even slices and place on the parchment paper lined baking sheet. Bake until golden, about 20 minutes, rotating halfway through. Let cool and enjoy.